Lecture by Angela Schmitz-Axe from Deloitte Consulting. It was my first time joining a BITKOM Social Media Working Committee. After the reception by Florian Koch (BITKOM) we had an introduction into the projected theme, goals and activities. Interestingly we heard that BITKOM itself is not active (yet) in social media, but today I found the BITKOM twitter account with over 200 tweets and 700 followers – quite confusing. The argumentation was to do nothing in Social Media, before you do something halfhearted and fail. In the first lecture Thilo Többens (Deloitte Consulting) spoke about the „Don’ts“ of social media activities, using examples of ryanair.com and bmw.com. 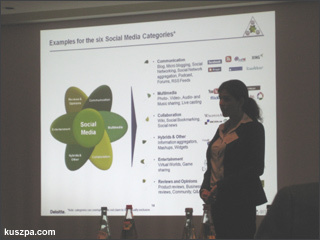 Angela Schmitz-Axe (Deloitte Consulting) added the Deloitte point of view on Social Media Eco System. With her statistics she also showed how slow Germany is in terms of using social media in comparison to USA, but also other European countries. Thilo Többens spoke about an adequate and reliable measurement of social media initiatives that needs to consider both quantitative and qualitative metrics for a Social Media ROI. The introduced Key Success Factors for a successful Social Media Strategy were also interesting; e.g. to develop a business case and to establish clear guidelines. At the end the Social Media Working Committee chose their new chairman Claus Fesel (DATEV) and the vice chairman Dr. Benedikt Köhler (ethority), Jens Mühlner (T-Systems International) and Thilo Többens (Deloitte Consulting).